We’re super excited to announce that this wall-hanging pattern is one of four that we’ve just introduced at Market this summer… Yaya!! Each of these patterns took a long time to design but I’m so pleased with the final results. We started the process by collectively sketching out our preliminary ideas onto graph paper… my mom then took these rough sketches and turned them into fabric mockups. 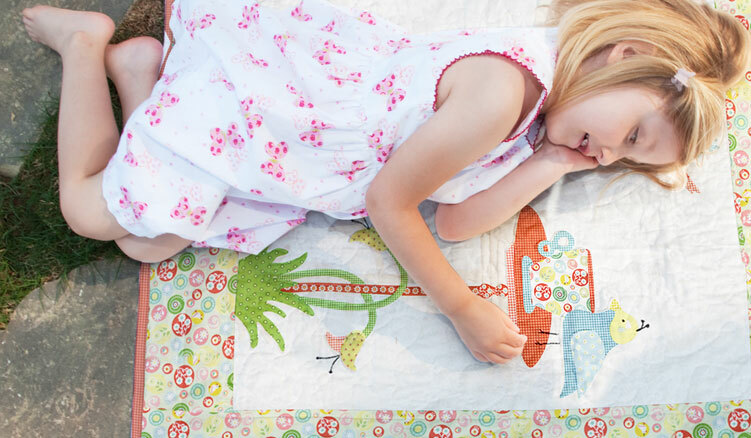 Next, she refined the designs into what was to become the final quilt. As she constructed the quilt for the second time, she wrote up all of the necessary instructions… She did one more test run in order to ensure accuracy as well as to create the final quilt that was sent off for photographs (taken by my friend Megan). I was in charge of all the diagrams… a project that I found to be excruciatingly tedious. To a non-quilter (like myself) the instructions that my mom handed over to me could have been in another language and they wouldn’t have been any less helpful. It took a lot of back-and-forth between the two of us before I was able to wrap my mind around what the diagrams needed to convey. Prior to starting my diagram task, I looked at a number of other quilt patterns in order to gain some inspiration and incite into what makes a pattern successful. And though some of them were nicely designed, I wasn’t able to understand any of them… something that I would find very frustrating if I were a new quilter (just having bought that pattern which turned out to be indecipherable). Though I’ve never actually experienced the feeling of a botched quilt pattern… I’ve had my fair share of kitchen mishaps that have left me dinnerless on more than one occasion. Because… if you think about it… it’s not just the pattern/recipe that you’ve wasted. It’s the fabric/food that got ruined due to said mishap. So with that in mind, we made it our mission to create patterns that anyone can use! 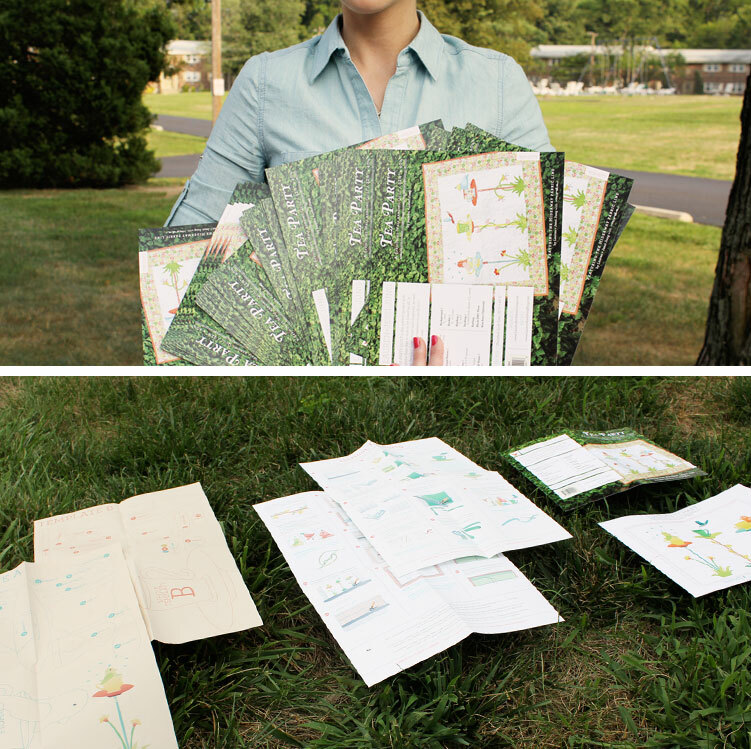 Each cover shows a photograph of the quilt on the front… with the dimensions, supplies, and description on the back. On the inside of the cover is a gridded/color-coded placement chart that quilters can use while placing their appliqué pieces. One thing that I found annoying with most appliqué templates is the mess of overlapping lines that you come across. I realize that overlapping saves paper, but it gets to be very confusing. We decided to maintain the overlapping line layout (because we’re an environmentally conscious company), but we decided to color-code our templates. Each piece contains a color-coded number, outline, and brief description, so that there’s no chance of mixing things up. Our sheet of instructions is very easy to understand because each step contains a corresponding diagram. So if you’re a visual person, you could get pretty far without actually having to read anything at all. If you’re like me… and prefer to read the instructions first, then check the diagrams to make sure that you’re understanding them correctly, then you, too, will be all set. Whoo-hoo! 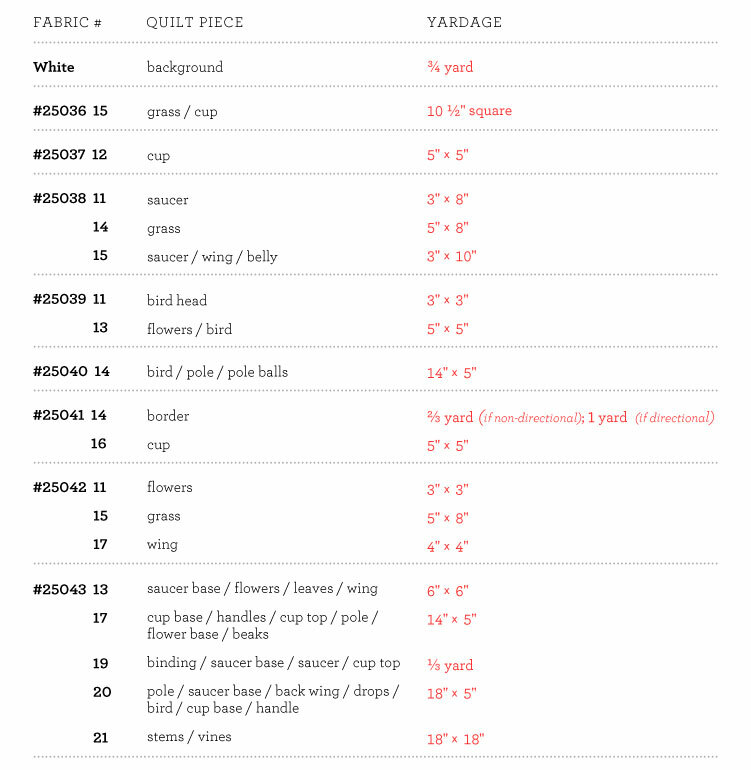 In case anyone else is interested in that info… I’ll post the sku numbers along with the necessary dimensions for each of the remaining three patterns in the next few blog entries. (And if you need that info before those posts are up, you can contact me directly by clicking here. This entry was posted in Hideaway and tagged Fabric Line, Hideaway, Patterns. Bookmark the permalink. Post a comment or leave a trackback: Trackback URL. Just came across you site and love it. 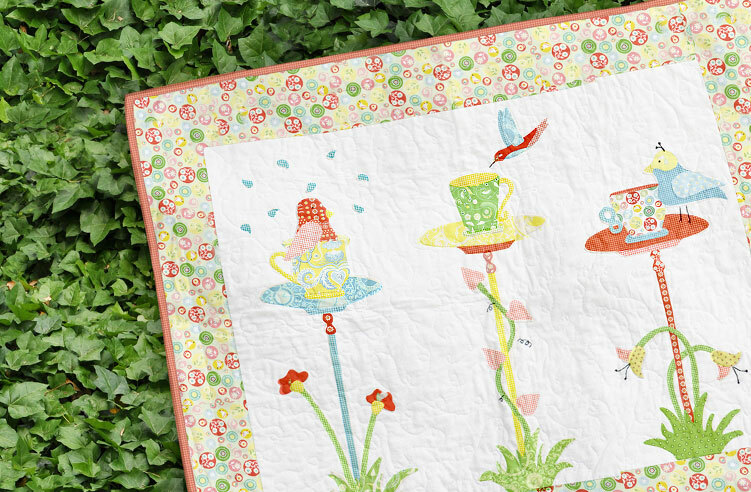 Can you tell me how to get the Tea Time Quilt pattern? It is lovely as are you pillows. 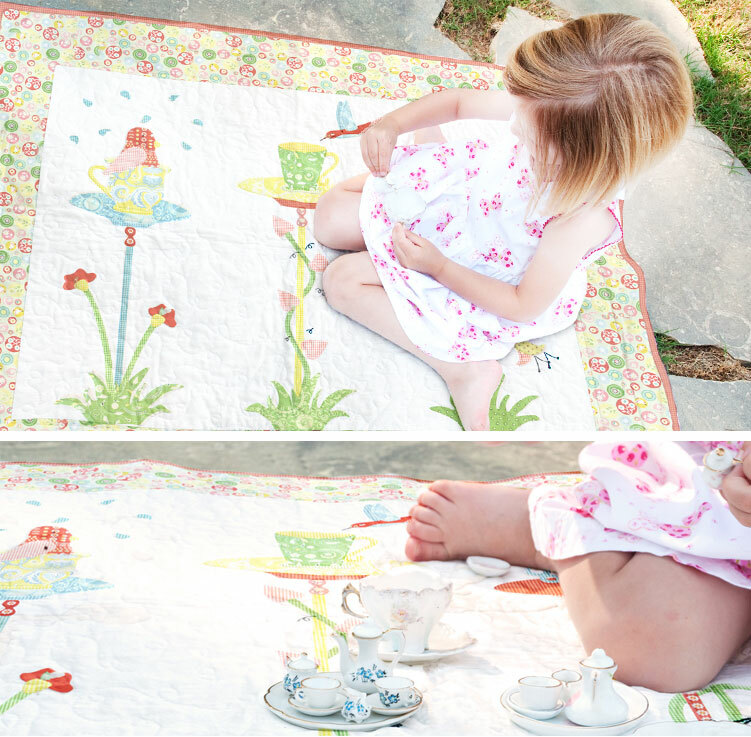 I think this is a lovely quilt idea and so sweet an appealing its perfect for little girls and big ones too. 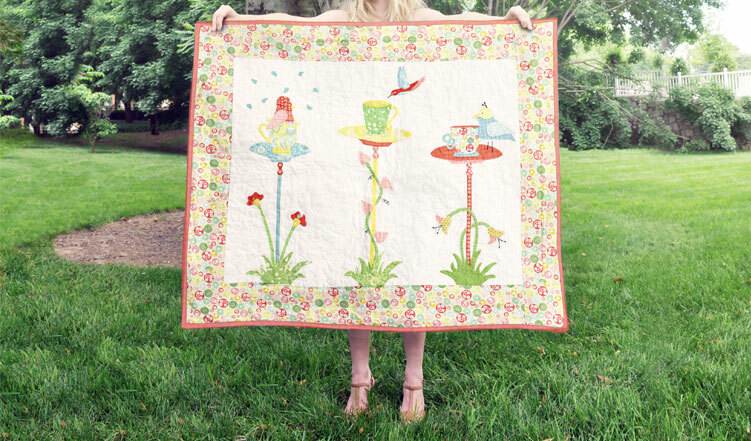 That is one lovely applique quilt. I can imagine that it must have taken a long time to write all the instructions etc. Well done to mum! So beautiful – what a wonderful creation! Congratulations – this will be a hit! congrats on the new fabric & patterns! this is gorgeous! i’m an applique junkie, so i’m ready to go! thanks so much for sharing!! Wow,that sure is gorgeous! Looks rather complicated in that I’ve never appliqued! Maybe someday I’ll have to give it a shot because this sure is beautiful and I have 2 little girls that would love to sit on this and play! !